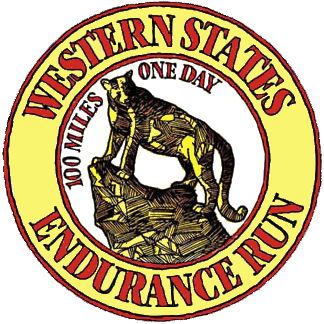 For nearly 40 years, the Western States 100-Mile Endurance Run has been the most iconic race of American ultrarunning. Its rugged and hot course, its humble origins from a crazy horse event made crazier by mountain man Gordy Ainsleigh when he ran it on foot (sub-24! ), and the heroic performances from runners, volunteers, and race directors that have astounded us each year since. It's hard not to get drawn into the lore and lunacy of it all. I am no exception, so it was with great pleasure I joined 353 fellow warriors for the 2016 edition last Saturday in hopes for some a little redemption. Thanks to a great crew, an amazing pacer, and the help of hundreds of volunteers, I got far more than I imagined. 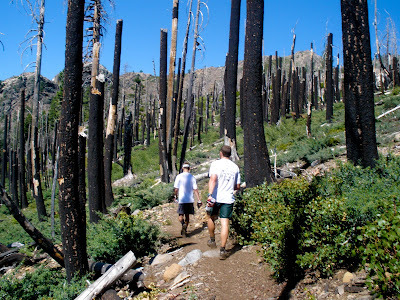 The first test of the Western States 100 (WS100) is having the patience to get in. I've lost the lottery for entry a record eight times, but in the process have been able to run it once in 2009 (back in the "two time losers get in" days) as well as joyfully participate as a pacer, crew, and volunteer on many occasions. 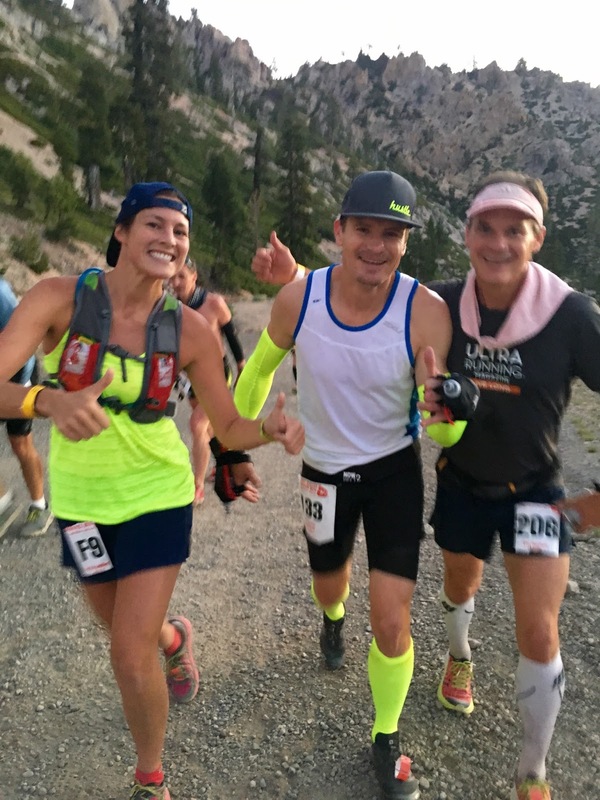 Plus the requirement to run a qualifier race each year has been a great excuse to travel to races such as UTMB, Wasatch, Pine to Palm, Rocky Raccoon, and more. Patience can be rewarding! For 2016, I was lucky enough to get a sponsor ticket from Scott Roberds and the great team at Microlumens, the same folks who ensured every runner got an awesome customized WS100 BigTruck hat in their swag bag. The previous year Scott gave the ticket to Gundhild Swanson, resulting in her epic finish just seconds under the 30-hour cut off to become the oldest female finisher of all time. Big shoes to fill! My goal for the day was simple - get that sub-24 hour silver buckle. My race in '09 was a zombie-staggering journey that I still consider one of the most defining spiritual experiences of my life. Failing every weigh-in for 45 miles, having the face of God in the starry night lead me to the river crossing, that second sunset as the forest awoke around me...I will always be grateful for that day. But a 28-hour finish isn't good enough for silver, and my original trail running bucket list specifically says "Western States - silver buckle". Could I go faster, maybe 20 hours? Probably. Was it worth screwing up and waiting another eight years to get in? Hell, no. So my crew and I built up a plan for 23:30 and got ready. HERE. WE. GO! My brother-in-law, Brian Drue, returned to captain my crew as he did in '09, this time with his 14-year-old daughter Ryann as his right hand. My Dad, Larry Dunlap, was also down to assist, making it three generations of family giving support. How lucky am I? The ace up my sleeve for this year was super pacer Whit Rambach, a friend and 7-time silver buckle finisher who volunteered to pace me from Foresthill (mile 62) to the finish. My fitness and health were good...I'm officially out of excuses! As the excitement built up for the 5am start, I was blissfully serene. This hasn't always been the case on race morning, but over the years I have built a deep appreciation for why we do mega-adventures like the WS100. They are a gift of rediscovery - a rare opportunity to seize something so epic, it is guaranteed to strip you down to the core of your being and recast yourself in a completely different light. Sucker punch that ego right off its self-appointed pedestal, and laugh out loud as it desperately tries to climb back up. Humility by the truck load, whether you need it or not. When you understand this deep seated purpose, the calmness centers you. Combine this with the knowledge that your team has your back, and you feel infinitely powerful. I have never felt more alive than I do as the clock ticks down. Within a few miles, the runners spread out on their way up the first 2,100' climb to Escarpment (mile 4). Now that the race is away, we gleefully focused on the simpler task of one aid station at a time rather than the dizzying magnitude of 100+ miles. 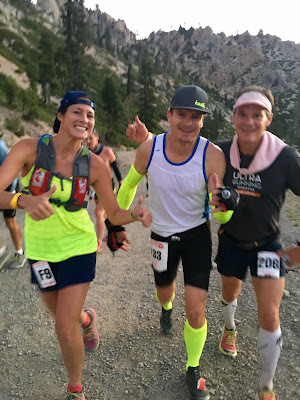 I found a nice fast hiking rhythm along with Karl Hoagland (Publisher of Ultrarunning Magazine) and Erika Lindland (F9 last year), only later realizing the planned weddings they both talked about was the same one to each other. We soon join Eric Byrnes, a former Major League Baseball (MLB) player and now sportscaster for MLB networks, enjoying every minute of his first 100 (and Instagramming most of it in real time). The pace was easy to the top, where Eric Schranz (of Ultra Runner Podcast fame) greeted us in full lederhosen and tooting his 10-foot alpenhorn. How did he get that thing up here? The high country was exploding with flowers, and a flurry of butterflies joined our conga line of runners as we jumped over the few remaining snow fields towards Lyon Ridge (mile 10.5). 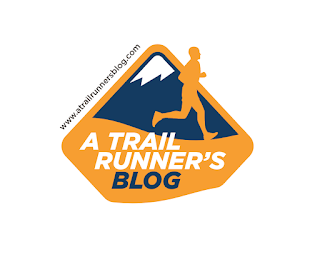 I could hear the conversations around me...for one runner, the WS100 is a lifetime goal, yet for another it's training for Hardrock in a few weeks. This is a crazy group! 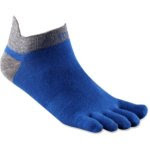 I took long, appreciative glances at the mountains ahead until I caught a toe and went down on the rocks. Bloody hand, but likely a blip on the pain radar given the next 20 hours. We pressed on to Red Star Ridge (mile 16), where the medical tent was happy to patch it up. The heat turned up as we made our way to Duncan Canyon (mile 23), but Mother Nature was kind enough to keep that cool morning breeze flowing from the valleys. I was surprised to find my Dad at the aid station, and chuckled knowing he pushed his little Prius to the limit to get there in time. We loaded me up on ice - a familiar theme for the rest of the day - packing it into my sleeves, hat, and neck bandana. I might leave the aid station numb, but within 20 minutes the ice would be gone! I had some solo miles at this point, and relished in the solitude. My steps synchronized in rhythm with my heartbeat like a jazz-inspired DJ...a simple breakbeat for the wind and songbirds to lay their melodic solos. New leaves burst from the soil-rich base of forest burnt stumps, filling my nose with charcoal, sage, and honey. Life is everywhere, and it is thriving! Brian and Ryann had a NASCAR pit stop ready for me at Robinson Flat (mile 29), and said I was right on the 24-hour mark. It was such a thrill to have Ryann there - I had forgotten how fun it is to see this aid station party in the middle of nowhere for the first time. I was clearly in good shape, so we loaded up on ice again, and I headed out with a smile. As we made our way down Little Bald Mountain, the runner behind me said "you're Scott Dunlap, aren't you?". He then pointed out that we ran this exact section together in '09, when both of us were listening to Michael Jackson right after the performers death. He said, "there was another guy with us too..." and I told him, yep, that was Whit Rambach, who is my pacer today. Deja vu! The trek to Last Chance (mile 43) was burning well into the 90's, so I stopped and had the car wash team soak me up as much as possible. I caught up to Eric Byrnes just in time to climb Devil's Thumb, and with his comraderie, we got it done without pause. This was where the wheels came off last time, so I was sure to take a seat and get my core temp down with some ice and popsicles. Beverly Anderson-Abbs was my assigned volunteer and perfectly mixed the "here's what you need" with "time to get out of the f'ing chair" advice. Ha! Thanks, Bev! The canyons proved to be as challenging as I remembered, but this time my body was holding up really well. A few twitches indicated I could use more hydration, but overall still able to keep a 9-10 min/mile pace. All of my crew was at Michigan Bluff (mile 55), and we took a few minutes to assess. Whit stopped suggesting and went right to prescribing - finish that burrito, I want both of those water bottles done by Volcano Creek, let's get to Bath Road within the hour. The crew was all nodding with crossed arms...love it! They are calling the shots now. Whit was right about the hydration, and after a kajillion small sips I came flying into Foresthill (mile 62) feeling good. We were slightly under the 24-hour pace, but Whit was more concerned about continued hydration. "Until I see you pee, I'm not going to talk about finish times". Love this guy! We cruised down to Cal 1 (mile 65) and Cal 2 (mile 70), and at Cal 3 (mile 73) put on our headlights. Soon after I finally had to take a bio break, while Whit yelled out to the river "YES! My racer is peeing!! I am the greatest pacer of all time!!!". Ha, ha! He's doing a great job in his first pacing gig, that's for sure. As we approached the river crossing at Rucky Chucky (mile 78), I secretly missed the hallucinatory face of God that had pulled me here in '09, but knew she was smiling up there somewhere. Bryan and Ryann were ready for anything, and then relieved to hear I was doing fine. They told me the story of Jim Walmsley showing up an hour ahead of course record, and then losing his grip on the rope across the river and getting swept downstream. Wha?!? That's nuts! Apparently he got back on track. They also let me know Kaci Lickteig had a healthy lead for the Women and looked good (Magda had dropped due to stomach issues), while Devon Yanko had come back from the dead to gain ground on Amy Sproston for F2 and F3. Wow, it's on! I got across the river, complete with a hug from super volunteer Tony Nguyen, and joined my Dad on the night hike up to Green Gate (mile 79). Apparently my Dad had gotten lost, only to find Kathy D'Onofrio in the dark and she made him jog to Green Gate. Work him, Kathy! We arrived at Green Gate with local Auburnite Matt Keyes, who had a small army of teenage pacers helping him get to his 10th finish. Matt unlunched at the aid station with crazy proficiency, saying he usually doesn't do that until Auburn Lake Trails (mile 85). I got some fresh socks and shoes, some grilled cheese sandwich and flat Coke, and we all hit the trail together. Whit was a master at tracking the time, and as we got through Brown's Bar (mile 90) and Hwy 49 (mile 93) he would tell me we were just under the 24 hour cut offs. He had this great way of reminding me to keep moving, saying "your pace is great...you know what that is? That's silver running right there, as in 'silver buckle'". Whit was right - if we were running, silver was within grasp, if we were walking, maybe not. Just then Clare Abrams went by pacing Sarah Lavender Smith running everything. Yes! Sarah is crushing it!!! Whit and I donned huge smiles, and we pulled in right behind them through No Hands Bridge (mile 96.8). 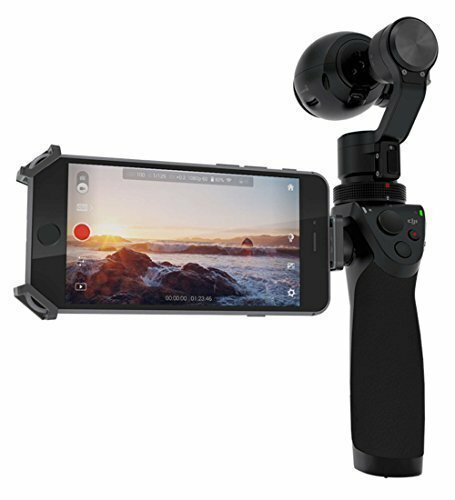 We were going to run everything now. In the last climb to Robie Point (mile 98.9), I allowed myself to believe this was actually happening. The lump in my throat was likely visible at this point, and as we exchanged congrats with a few runners now easily cruising under 24 hours. I wanted to hug everyone. The track at Placer High came into view, and the tears welled up. My crew was there, my pacer was stoked, and we crossed the finish in 23:43 for 95th place. We did it, you guys! We did it!!! Craig Thornley gave me a big hug, and I took a seat to donate some blood for the medical tests before relishing the last few minutes of dark. Per usual, there were stories galore at the finish. Andrew Miller (15:39) became the youngest winner ever after Jim Walmsley took a wrong turn, then fought his way back to 20th place. Norway's Didrik Hermanson (16:16) took second, and super master Jeff Browning (16:30) crushed it for third. Kaci Lickteig (17:57) ran the 4th fastest Women's time ever to claim the win, with Amy Sproston (18:54) and Devon Yanko (19:10) finishing a tight race for the podium. (all results) Despite the heat in the high 90's, the finish rate was an astounding 79%. Well done, everyone! My runners high has been off the charts for days now, particularly as I ponder the deep camaraderie it takes to do what we do. Yes, the race is about rediscovery. But it's also about surrounding yourself with heroes, and letting their inspiration fuel you. I stare over the mountains and smile thinking about all those who have filled my soul this weekend. Craig Thornley and the race crew who puts on this gold standard event. Tropical John Medinger, John Trent, and the Board of Trustees who pave the way for generations to come, while board member Karl Hoagland collects another silver buckle. 72-year-old Wally Hessletine crossing the finish thirty-two seconds after the cut off, only to declare he will return next year when another runner donates his entry to him. Lifelong friend Jeff Clowers at Duncan Canyon, and seeing Tony Nguyen braving the river for us. Meghan "The Queen" Arboghast and Matt Keyes getting their 1000-mile buckles. Jim Walmsley fighting back to 20th when he could have easily dropped. The incredible performances of faces I know, and faces I just met. The smiles and tears of runners and families that roll all morning long on that Auburn track. Endless inspiration, all in one day. But most of all, I am inspired by my crew and pacer who helped me execute that perfect plan for silver. Their love, friendship, and support means the world to me. Sometimes it takes 100 miles in one day to remember that. I've already arranged to have their names engraved in my silver buckle next to mine, as they deserve to be. They have my eternal gratitude. Congratulations, all you Western States runners, pacers, crew, volunteers, supporters, and family. You are all crazy! And I love you for it. Such a great write up, Scott. You haven't inspired me to do this craziness, but you have my undying admiration not just for the run, but for the way you write! Thanks, guys! I hope you are having an awesome summer. Wonderful report, Scott, and thanks for including my pics! Seeing you and leapfrogging a couple of times during those last few miles meant a lot to me, since you've been an ultrarunner I've admired and followed for more than a decade. We kind of fell out of touch the last couple of years, but I feel that shared experience last weekend really reconnected us. Big congrats to you! And small world: I just found out yesterday that I was assigned with Whit as my partner to do a 30+ mile section of course clearing for Hardrock, so I no doubt will appreciate Whit's experience too as we cope with challenging conditions! Thanks for you report's details and pics -- a really great recap. What an outstanding run you had, Sarah! Congrats on your silver buckle as well. Whit and I were so thrilled when you came along, it was a great boost. I look forward to your report - your writing is as inspiring as your running, which is saying a lot! Enjoy your summer in the wild! From a Volunteer at Cal 3 who no doubt was manning the AS when you came through I say congratulations! 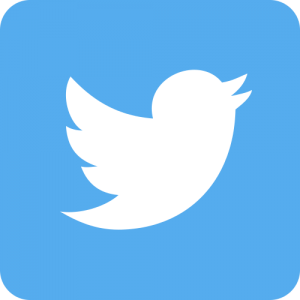 A great and enjoyable report! Enjoy your accomplishment! Silver! Thank you so much for volunteering! You guys were amazing. And your grilled cheese was top notch! Congrats on your climb! We loved it so much there we are headed back in August. Sierre-Zinal! Sounds like we helped each other! Congrats!!! Silver buckle! Congrats to you! nice work on a hot day. Night work Scott. Always an enjoyable read. Your passion for the sport comes through well in your posts. Thank you for volunteering! You guys are a big part of the experience! I hate to say this, but you make me almost want to do something stupid like run a 100 miler... Well done! Wow. This is something else. Congrats from London! A good point, Phil! I'll keep putting in for States, I think. It's quite an experience! What a thrill to bump into Larry at Duncan Canyon this year. I hadn't seen him since Brighton in 2011 when I delivered you to Mick for your finish at Wasatch. You have his genes, so you too are ageless and will be running WS for many more years. Keep it up and congratulations. Kirk! Sorry I didn't stay to chat. Larry was thrilled to see you again! Mick did really well this year - were you crewing?